Corvina REX Frescamar participated on the opening ceremony of the new MAKRO Zona Franca celebrated at the beginning of June. The Dutch Distribution Group wanted to count on Frescamar to honor the customers who came by the shop on this opening day. For this reason, the aquaculture company prepared a bunch of activities among which an outstanding show cooking fascinated the attendees. The culinary proposal was organized by chef Sebastien Gros escorted by two students from the Centro Superior de Hostelería del Mediterráneo: Antonio Puche and Alejandro Ruiz. It all started with a tasting Corvina REX ceviche prepared at the very same moment. Afterwards the company offered an interesting speech about aquaculture in general and this species in particular. Later on, on the fish counter area, an authentic master class was held to show different cutting options for corvina. The day ended up with a show cooking in which Sebastien Gros made an original smoked corvina salad with red berries and ravigote sauce that amazed everyone not only for the elaboration but also for its flavor. 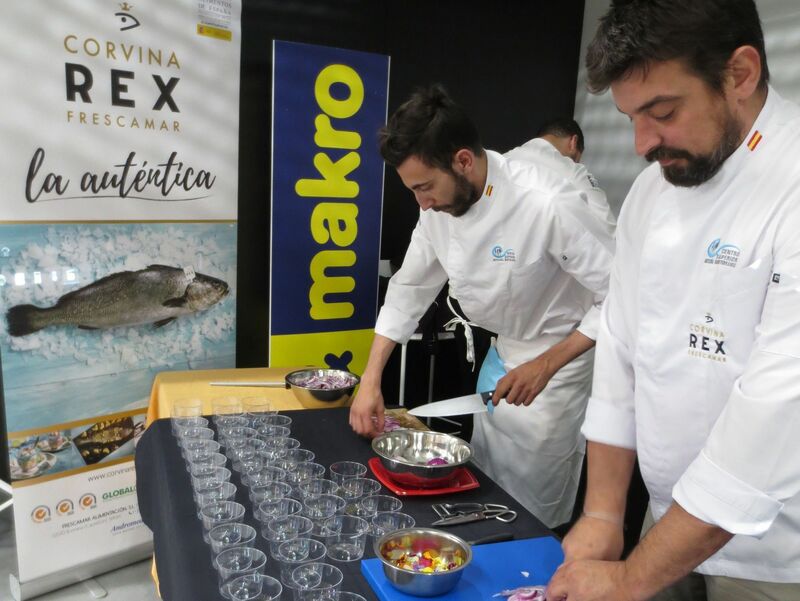 We appreciate the participation of the Centro Superior de Hostelería del Mediterráneo and, additionally, we wish a great success to this new Makro shop, with more than 7.000 square meters dedicated to catering specialists with high quality products such as Corvina REX Frescamar to fulfill their needs.